Changing products or blends is fast and simple with our Automated 30 second Feeder test calibration. Goldridge’s state of the art Blending Plant Bins are all on scales to allow automated control of product feeding, this ensure that we get a consistent product. 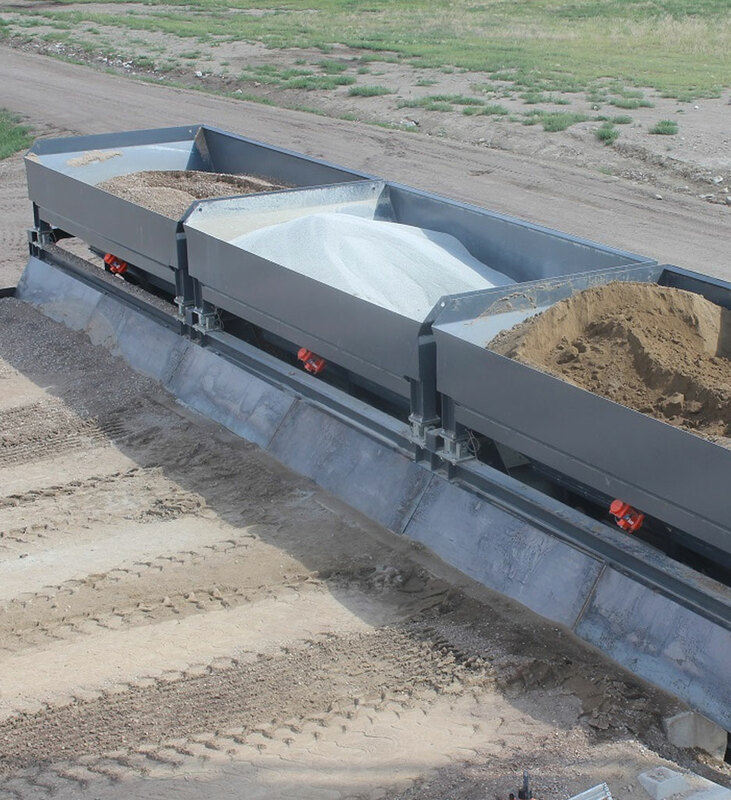 All products are first ribbon layered on the belt and then mixed in a 500 ton/hour Sicoma Pug Mill Mixer for consistent mix. If product sticks or hangs the automation program will correct the speed so that the actual rate follows the target rate, if the deviation of the actual and target rate reaches a set percentage the plant will automatically shut down in an alarm mode because it will maintain the correct lost in weight. Without scales on a mixing plant you would never know if you are feeding properly until you would see that it isn’t flowing. The Fine material has a very inconsistent flow characteristic because its sticks and hangs very easily in a feeder bin if you have a slight change in moisture. Our feeders are controlled by a VFD (Variable Frequency Drive) that will automatically change speed to maintain a consistent feed based upon the recipe. Our plant has vibrators that are controlled based on the weight in the bin. If bin is full the vibrators come on more frequently. Our plant will show history on actual and target product rate on each feeder bin. With our Innovative technology we are able to save time and money on costly ingredients not being measured correctly.